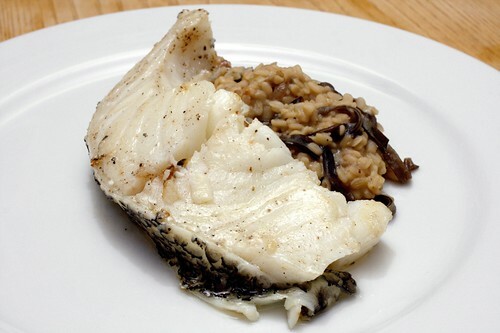 olive oil poached chilean sea bass over mushroom and white lentils, originally uploaded by aarn! +1st June, 2010+. placed a 1-lb steak of chilean sea bass in a deep casserole dish with a diced half of a yellow onion, a few sprigs of thyme, salt, pepper, and enough olive oil to just barely fully-submerge the fish. placed the covered baking dish in a 180-degree oven for 1.5-hrs. pulled the sea bass from the oil, patted off some of the excess oil, and seared both sides in a hot skillet until lightly browned. sweated the finely diced bottom of a leek in 2T. butter in a sauce pan until tender. added 2-cloves of poached smoked garlic, salt, and pepper, and 3/4c. white cooking wine. let the wine reduce about half way and then added 1c. of white lentils, thinly sliced oyster and wood ear mushrooms, and 2.5c. of chicken stock. allowed to cook, covered on low heat, until only a small amount of liquid remained in the bottom of the sauce pan, then mounted with 2T. of butter and cooked until adequately bound. served the sea bass over the lentils on a warm plate with a squirt of fresh lemon juice over the top.